Mr. Cat apparently doesn’t approve of my attempts at holiday merriment. I came home today to find a small wooden deer ornament on the floor with one of its legs gnawed and twisted off at a terrible angle. At least they didn’t get the snail. 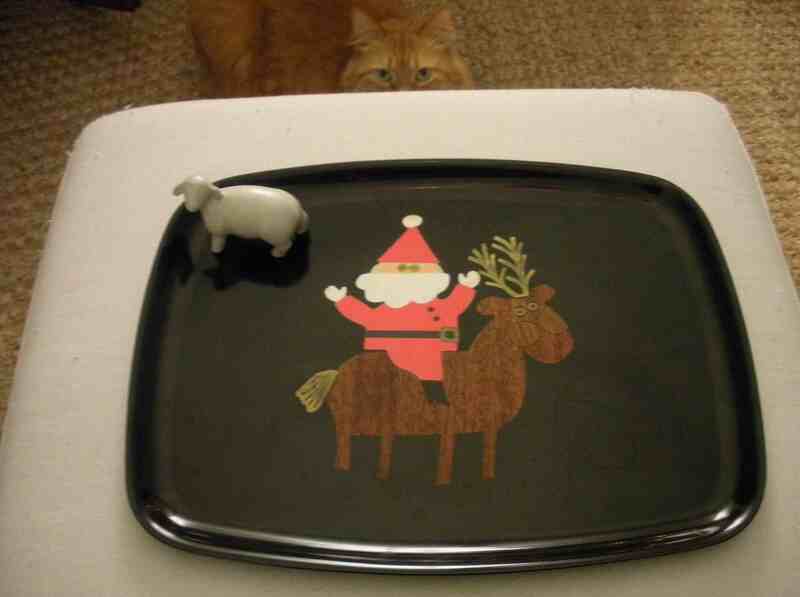 I love this tacky little tray. I bought it last year at Savers and have been looking forward to using it to… display a ceramic lamb? The lamb is part of a set that also includes another lamb and some sort of pony/donkey/horse thing. They’re meant to supplement a Nativity set, but the pony thing hangs out near my old books year-round. I’m less fond of the lambs, but at 84 cents for the set, it hardly matters. HER sinister look? He’s a MISTER! Are you too cool for proper grammar today? I’m telling your students. that tray is AWESOME. you should have it out all the time.